October 13, 2018 – 9:00 a.m. till 3:00 p.m.
Due to the great interest in this program, we are offering it again on a Saturday to accommodate our visitors. The home was constructed sometime between 1804 and 1810 on what is now Gravois Road in South St. Louis County. Zephaniah Sappington was the oldest son of Sgt. John Sappington, a Revolutionary War hero from Maryland who, with his family, came to the Missouri Territory at the beginning of the 19th century. Sgt. John Sappington also fought with Daniel Boone at the Battle of Blue Licks in Kentucky and served time as a trustee of Fort Boonesborough, the first permanent American settlement in Kentucky founded by the Boone family. The Zephaniah Sappington home was “the next-door neighbor” to Whitehaven, the childhood home of Julia Dent and, after her marriage, the home of Julia and her husband, President Ulysses S. Grant. The Zephaniah Sappington home was purchased by Henry Dressel in 1887 when Dressel’s son, John, was nine months old. John Dressel lived in the house for the next 100 years. John Dressel became a well-known civic leader in the Sappington area. Through his efforts, the Lindbergh School District was chartered in the home in 1949. The home was at risk of being destroyed in late 1987, but public interest in preserving the house, spearheaded by Colonel Robert Pecoraro, Colonel Barney Combs and the Historic Daniel Boone Home staff saved it from demolition. This coming November marks the 31st. anniversary of the saving/dismantling of the Zephaniah Sappington/John Dressel Home. 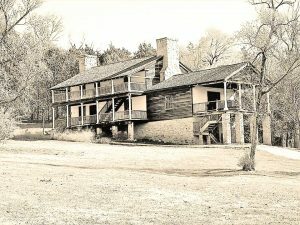 Randall Andréa, the former director and operator of the Historic Daniel Boone Home, believed it would be an appropriate addition to the living history village being constructed at the Boone Home and carefully catalogued, dismantled and moved the building to the Defiance property for reconstruction. When Lindenwood University acquired the Daniel Boone Home and Boonesfield Village in 1998, it made completion of the Sappington-Dressel House one of its first priorities. Lindenwood University dedicated the reconstructed Sappington-Dressel Home, a landmark home at a private ceremony on Saturday, October 21, 2000 at the Historic Daniel Boone Home and Boonesfield Village. The Daniel Boone Home at Lindenwood Park is now a part of the St. Charles County Parks system. Have you ever wanted to see the inside of the Zephaniah Sappington/John Dressel home and see how it was dismantled? Have you ever wanted to know about the history of this Historic home that was listed on the National Register of Historic Places in 1980? This program will be FREE to the public and you will be able to enter the home and view the display of photographs, pamphlets, newspaper articles and video of the dismantling. Meet Colonel Pecoraro and Colonel Combs as they discuss the process that went into the saving and dismantling of this historic home. The Sappington/Dressel Home is not often open to the public, so this will be an excellent opportunity to see this beautiful home on the inside. September 19, 2018 in Related Events in Area.